We are the Leading Manufacturer and supplier of wide range of Automatic Solid Wall Brick Machine Manufacturer. Enlarge the available area of the work table: The appliance of the advanced vibration technology causes the larger work table, it makes that the productivity is increased greatly. Particular vibration type: The computer controls the pressure and flowing rate of hydraulic system; vertical synchro vibration, frequency conversion; brake. Transforming the over quantity of hydraulic oil to a vibrating activated force, thereby basically eliminating the energy waste. 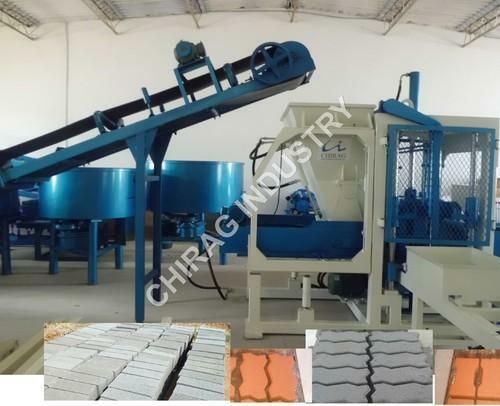 Inaugurated in 2015, Chirag Industry is working as a trustworthy Manufacturer and Trader of Brick Making Machine, Block Making Machine, Concrete Batching Mixing Plant, Pan Mixer and many more. Our machines are used for paving blocks in footpath, car parking and other places. The philosophy of continuous innovation focuses on delivering quality and broad product range improvements to our customer base. Since our incorporation, We are focused towards serving our clients with most beneficial & cost effective solutions. We have been affiliated with the reckoned vendors of the market, who are efficient enough to meet the bulk & urgent orders of the patrons within the specified time schedule. Our work force conducts market research time to time so as to keep pace with the latest market development, upcoming technologies and changing demands of the buyers. We always examine products on the basis of well-defined parameters of quality, So that, they can assure perfect performance. In addition to this, We have a spacious and large warehousing unit that helps us to keep, our offered range under the safe and secure environment.